Daniel Auerbach is a doctoral candidate in sociology at the University of Utah. Brett Clark is an associate professor of sociology at the University of Utah. 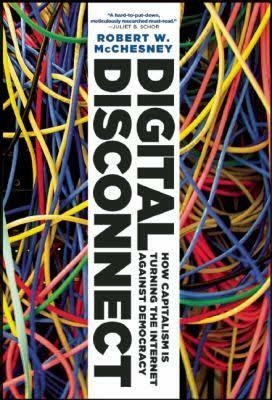 Robert W. McChesney, Digital Disconnect: How Capitalism Is Turning the Internet against Democracy (New York: New Press, 2013), 299 pages, $27.95, hardcover. Without question, the Internet has had a profound influence on the world. As with most technologies, debates rage over whether this development has been positive or negative. Celebrants proclaim with utopian fervor that a new age of democracy has arrived, allowing for decentralized communication, challenges to corporate control, and mass public participation in the most important decisions confronting humanity.1 Skeptics point to the ways the Internet has spread ignorance and misinformation instead of knowledge, undermined the ability of artists to earn a living, and exacerbated isolation, unhappiness, and alienation.2 While these arguments illuminate the potential benefits and drawbacks of the Internet, they tend to ignore or disregard the larger political economy within which the Internet exists. In Digital Disconnect: How Capitalism Is Turning the Internet against Democracy, Robert W. McChesney transcends these one-sided engagements, offering a nuanced analysis of the development of the Internet within the context of monopoly capitalism, revealing both the limitations of this technology in its current state and its massive potential. McChesney focuses on the tensions and contradictions arising from the Internet’s place within the larger political economy. Capitalism shapes the development of technology, while the latter also influences social relations and interactions within society. The Internet, while presenting some challenges to the capital accumulation process, has become—on the whole—subsumed under its dictates. The Internet’s potential to add to public wealth has been largely directed to increase private riches.3 Through his historical analysis, McChesney traces the commercialization of the Internet, the ongoing degradation of journalism, and the threat to democracy. These trends follow the long-term dynamics of monopoly capital. Nevertheless, he argues, the present moment is a critical juncture, where the conditions exist for revolutionary change, which would by necessity involve transforming the political-economic system and the Internet. The Internet, McChesney writes, is the culmination of “government-subsidized-and-directed research during the post-World War II decades, often by the military and leading research universities” (99). The decentralized and open technology of ARPAnet, a key predecessor to the Internet, was largely the creation of researchers and scientists on the fringes of corporate and military institutions. According to McChesney, it was because of this very openness that ARPAnet initially held little interest for large monopoly telecommunications corporations such as AT&T. They found such pursuits, at that point, to be unprofitable (100). It was not until the mid-1990s that the Internet was transformed from a public service (as NSFNet) into a private good, subject to the dictates of exchange value and market forces. This transformation has had a decisive impact on who has access to information, what information is most accessible, and the content of the Internet. Corporate control over the Internet, according to McChesney, was the result of four pivotal factors: corporate-dominated policy-making in the 1990s; unclear policies regarding the regulation of the Internet; the neoliberal political culture of the ’90s; and the Internet bubble of the late ’90s, which made it seem as if the Internet was ripe for further privatization (104–08). By allowing private interests to take control of the development and design of the Internet, the optimism of a once anti-commercial endeavor turned into a juggernaut for capital accumulation, with substantial social consequences. The Internet was turned into a means to satisfy the needs of capital, rather than the public. With the aid of existing government-sponsored monopolies, the telephone and cable industries were in sole control of the cables and other infrastructure necessary for Internet access. Changes in the legal designation of cable modems as “information services” instead of “telecommunication services” allowed monopolistic cable and telephone companies to dominate the Internet Service Providers (ISP) market. Further consolidation of monopoly control followed. In the 1990s, the ISP market was much more competitive, with a large number of providers. By the mid-2000s, this landscape had changed. McChesney notes that approximately “20 percent of U.S. households have access to no more than a single broadband provider,” and “all but 4 percent of remaining households has, at most, two choices for wired broadband access” (112). Thus, the majority of households effectively do not have a choice when it comes to accessing the Internet. Another consequence is that the monopolization of ISPs has a tendency to limit and slow innovations in the quality, speed, and accessibility of broadband access, due to lack of competition. Companies like AT&T and Verizon enjoy exclusive license to large swaths of the electromagnetic spectrum that they allow to lie fallow, so that other ISPs cannot use them (115). As noted above, most areas in the United States have only two real choices for their ISPs; consequently, the United States has one of the most expensive broadband systems in the world, compared to other wealthy nations (114). There are two other major effects of monopolies on the trajectory of the Internet: the patent grab and the mass proliferation of advertising. Both of these are necessary requirements for accumulating capital in a realm where information is, potentially, freely available. In Internet telecommunications as in other industries, owning patents is quickly becoming a primary means for protecting monopoly power. In a sentence that echoes Paul Baran and Paul Sweezy’s argument in Monopoly Capital, McChesney writes that “patents halt the [innovation] process, but they are fantastic for protecting entrenched monopoly power, litigation costs notwithstanding” (134). Large companies such as Google, Apple, Microsoft, and Amazon have tens of billions of dollars available to purchase patents and build further barriers to entry (137). In 2011, Google spent $12.5 billion on buying Motorola Mobility, not for its existing technology, but primarily to take ownership over the company’s 17,000 patents (134). This proprietary control allows companies to lock consumers into using only their products while transferring power over future development from the intellectual commons to the realm of private wealth. Capitalism, of course, requires continuous accumulation and growth, and freely available services, such as most websites, represent a barrier to this process. Advertising—which U.S. companies may write off on their taxes as a business expense—has accordingly become a necessary tool for monetizing and commercializing the Internet. To access free online services, users enter into an often unspoken deal in which they must surrender their personal information. As Bruce Schneier has put it, “If something is free, you’re not the customer; you’re the product.”5 Websites serve as sources of information and entertainment, but also a means to collect massive amounts of data. As McChesney notes, all of our online habits are recorded through our various devices to generate more targeted advertisements (157). One particularly damaging consequence of this process is the severe narrowing of the range of information and ideas available to Internet users. The data collected on each individual is used to create specific filters that limit exposure to the variety of information potentially available online, while “personalizing” everything from sales pitches to videos to news stories as part of the hyper-commercialization of the Internet for the sake of capital accumulation (157–58). Monopoly capitalism in general, and advertising in particular, have important implications for journalism, as the Internet becomes the predominant medium of journalism. McChesney consistently argues that rigorous, independent journalism is a public good necessary for a “democratic society wherein individual liberties are meaningful” (174–75). Here the paradox of the Internet’s potential as a public source of knowledge and its actual development as a vehicle for capital accumulation comes to the fore. Journalism, in the age of the Internet, could remove barriers to entry, allowing for more diverse and critical voices to be heard and to collaborate with one another. Furthermore, as the cost of digital distribution declines, so too could the cost of running a news website. However, the profit motive of capitalism tends to undermine these conditions, as attempts to monetize journalism become paramount and as advertising revenue and social media visibility take precedence over challenging writing and reporting. According to McChesney, the decline of journalism predates the Internet and can be traced in large part to the broader monopolization of media, and particularly newspapers. In the 1970s and 1980s, as media corporations merged and consolidated, they found that an effective way to increase the bottom line was to decrease editorial budgets, which was in turn accomplished by eliminating journalists and closing news bureaus. Journalism was transformed from a craft dedicated to informing citizens to another means of satisfying corporate investors. With the movement of journalism to the Internet, this problem has worsened and taken on a distinct form. Successful journalism, in the age of monopolization and the Internet, has been reduced to “producing an immense amount of material inexpensively” (188). Online news sources are compelled to collect vast amounts of information about their readers in order to determine what content to display and promote. Based on this information, freelance writers hastily assemble articles tailored to these “popular” search terms. Media companies, equipped with detailed knowledge of their readers, then sell advertising placed next to or within each article. In an age of “sponsored content” and “promoted posts,” the line between news and advertising is increasingly blurred. Additionally, journalists are expected to write more while earning less, as more content brings in more traffic, which generates increased advertising revenue. This system of exploitation tends to inhibit journalists from adequately investigating and reporting important issues. Instead, they turn to the same sources of established information to produce what amounts to a rehashing of other news sources. The profit motive of monopoly capital has intensified in the digital realm, creating a journalism that remains relatively impotent in the face of corporate greed and government ineptitude, helping reinforce the status quo. Monopoly control over the development of the Internet has serious implications for the future of democracy around the world. What could be a means of uniting people, a venue for alternative viewpoints, and critically engaged journalism has instead become a site of hyper-commercialization—a tool to facilitate capital accumulation. Monopoly capital, with its tendencies toward privatization of public goods, has narrowed innovation to suit the demands of profit. Such constraints only exacerbate pre-existing inequalities, creating ever wider gaps between classes and social groups. Meanwhile, a select handful of large monopolistic firms have become gatekeepers to information. Online experiences are increasingly funneled to a select few websites: in 2010, the top ten websites accounted for 75 percent of page views in the United States (190). Finally, the problems of journalism are magnified under the advertising-driven profit model of online news. It is important to note that McChesney does not argue that technology itself is driving this undemocratic process. Rather, it is the general tendencies of monopoly-finance capital, which take on historically distinct forms, mediated through technology. McChesney shows the dialectical tension between the social relations of monopoly capitalism and the technology through which it develops, helping us see the Internet in its material and economic reality, unclouded by either utopian optimism or obstinate pessimism. Furthermore, by virtue of this dialectical analysis, McChesney’s examination avoids the trap of technological or economic determinism, allowing him—and us—to keep sight of the Internet’s liberatory potential. He insists that “battles over the Internet are of central importance for all seeking to build a better society” (232). We reside at a critical juncture, where new communications technology could be used to challenge established systems; where advertising-driven content is increasingly questioned; where social movements are fighting for radical change; and where political, economic, and social crises are rife. For the digital revolution to be more than a rhetorical flourish, a social revolution must triumph over capitalism, unleashing the potential of democracy. ↩See Yochai Benkler, The Penguin and the Leviathan (New York: Crown, 2011); Clay Shirky, Cognitive Surplus (New York: Penguin, 2010). ↩See Shaheed Nick Mohammed, The (Dis)information Age (New York: Peter Lang, 2012); Clifford Stoll, High-Tech Heretic (New York: Anchor, 1999); Sherry Turkle, Alone Together: Why We Expect More from Technology and Less from Each Other (New York: Basic, 2011). ↩See John Bellamy Foster and Robert W. McChesney, “The Internet’s Unholy Marriage to Capitalism,” Monthly Review 62, no. 10 (March 2011): 1–30. ↩Broadband Commission for Digital Development, Broadband 2015: Broadband as a Foundation for Sustainable Development (Geneva, Switzerland: UNESCO, September 2015), 26, http://broadbandcommission.org. ↩Bruce Schneier, Data and Goliath: The Hidden Battles to Collect Your Data and Control Your World (New York: Norton, 2015), 53.